Can Hayley Atwell find a hit TV series? Has the Conviction TV show been cancelled or renewed for a second season on ABC? The television vulture is watching for the latest cancellation and renewal news and this page has been created as a dedicated place to track the status of season two. You can bookmark this page or subscribe for the latest updates. Remember, the television vulture is watching your shows. Are you? 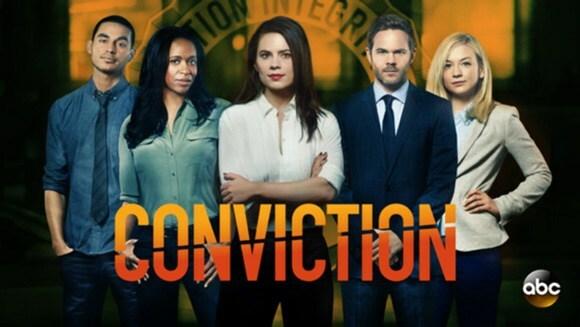 Airing on the ABC television network, Conviction follows attorney Hayes Morrison (Hayley Atwell), the daughter of a former President, as she gets “blackmailed” into joining the Conviction Integrity Unit. It’s an NYC department that re-examines cases when there is suspicion of wrongful conviction. The rest of the cast includes Eddie Cahill, Shawn Ashmore, Merrin Dungey, Emily Kinney, Manny Montana, and Daniel Franzese. Season one is averaging a 0.65 rating in the 18-49 demographic with 3.58 million viewers. Compare its performance against the other ABC TV shows we’re tracking. On May 12, 2017, Conviction was officially cancelled by ABC. Hayley Atwell was charming in Marvel’s Agent Carter but the ratings were lousy and the series was cancelled. I think the network was hoping that her fans would help make Conviction a hit. Unfortunately, the ratings were low to start and they’ve gotten much worse. ABC didn’t order any more episodes beyond the initial 13 episode order. That, combined with the terrible ratings, means that it’s very doubtful that Conviction will survive to see a second season. Unfortunately, we may not get official word from ABC until May. My condolences. Better luck next time, Ms. Atwell. 5/12 update: ABC has officially cancelled Conviction after one season. Details here. Read other Conviction TV series posts. What do you think? Did you watch Conviction on ABC? Do you think that ABC should have given this show more time or renewed it for a second season? But as we’ve all witnessed at some point or another, NETFLIX will pick it up and revive it, hopefully. That is bad tv…..who decides…not the people who watch…..need shows that work ur brain…brain candy shows need to go , we have too many of those! This series was a definite improvement on the usual programing. I will definitely be sorry to see this one be cancelled.